Jesus Christ is represented here as t he Lamb of God, who died for our sins and rose again to triumph over death. 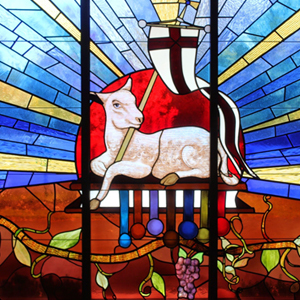 Shown below the Lamb are the seven seals which he alone is worthy to open. The Lamb carries a staff with cross and pennant. The staff represents the cross, and the white pennant with the red cross on it represents the Body of Christ, crucified for our salvation.